My Bonfire Coat is a herringbone Harris Tweed from the 1960’s. I found it at an AMVETS in Chicago in the early eighties and wore it everywhere for about the next decade when I moved from city to city to country to city. I built a house and a boat in this coat one very cold winter in upstate New York and cleared land and burned brush in Exeter, Rhode Island that spring. I met my wife while wearing this coat at the Aldrich Estate in Annandale-on-Hudson on October 1, 1988. I’ve kept the coat in my woodshop since we moved to California and mostly wear it on chilly mornings while I get a fire going in the woodstove. I also wear it for our annual bonfire, a seasonal ritual born of accumulated apple prunings, wood scraps and giant fallen ‘widow makers’ from the redwoods. 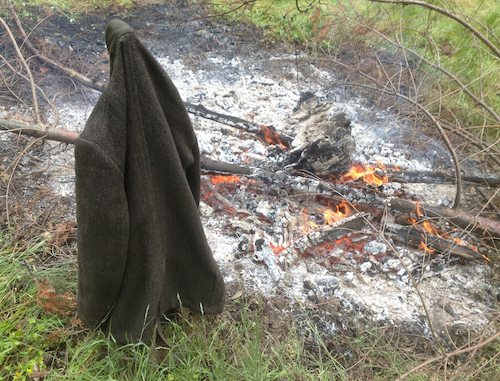 The coat keeps me dry in a light rain while shielding the sparks and intense heat of a roaring fire. This year I noticed a disturbing cluster of moth holes and was tempted to throw the coat on the fire as it burned down. I think I’ll give it one more year. 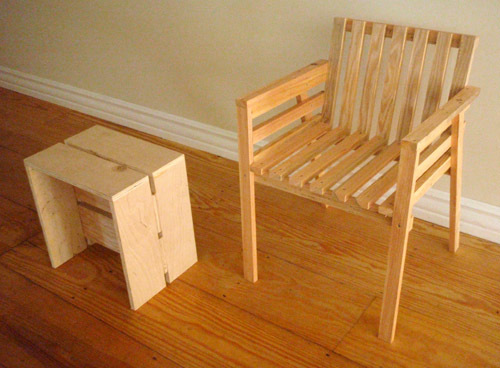 Arborigin is a collaborative project that brings together artists, designers and artisans to produce fine products from a single elm tree salvaged from Chicago’s urban forest. We invite those interested to submit a proposal to use some of our inventory of cured lumber and hope to bring the finished products together for a pop up store in Chicago in 2014. In simple commerce we aim to incubate ideas for ongoing partnership. Arborigin is akin to the farm-to-table movement in food. The project asks us to consider what kinds of products a single tree might yield when the means of production, distribution and sales are highly localized. What stories and values become embedded in everyday objects when we know exactly what they were made from and who made them? 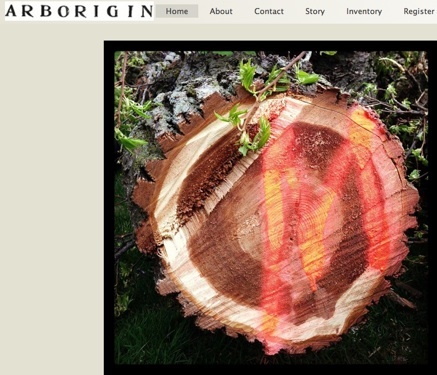 Arborigin asks us to think differently about trees, about things and how they are made and used, about the relationships that connect us to place. • Design/ Craft: preferably small multiples of everyday objects such as furnishings, housewares, toys and games, instruments, or other functional objects. To learn more about Arborigin and register to participate, please click here (www.arborigin.com). To read about the development of the Arborigin Project, please click here and scroll down. I’ve so far drawn the line at a scale of operations I call ‘Forklift and a Warehouse’. If it ever seems like I need a forklift and/or a warehouse, I know I made the wrong turn somewhere. My current production capabilities allow me to efficiently make one-offs, prototypes and very small production runs, but not much beyond batches of 4 or 5 of any given thing per week. While I love the creative flexibility inherent in running a small shop, I am beginning to find clients for production versions of my designs, and am poised to scale operations to meet demand and still offer a competetive price point. 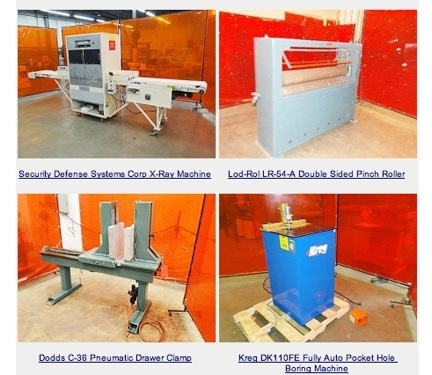 Investing in a few new tools will increase my efficiency exponentially, so I’ve subscribed to a handful of online auctions for woodworking tools, and scour daily posts for re-saws, glue spreaders, wide belt sanders and the like. At first, I greedily scrolled through listings, knowing exactly what I was looking for. As the daily emails persisted, I became painfully aware of how many small manufacturers were closing throughout the US, predominantly on the East Coast. I began to see the tools differently, as orphaned tools, tools that had been loved and maintained, tools that had supported livelihoods, helped put kids through college and pay mortgages. Suddenly the images had such poignancy. The images themselves are what appeal to me now, as an incidental archive of a major shift in the culture of (not) making things in the US. 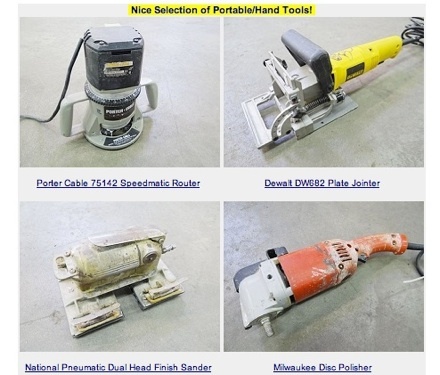 I would love to make an exhibition or publication that simply collates and displays online auction house photos of tools for sale. Meanwhile, I still seek the perfect tool to expand my capabilities, but worry about the fate of so many obsolete or unwanted tools (and skilled workers) in the process. 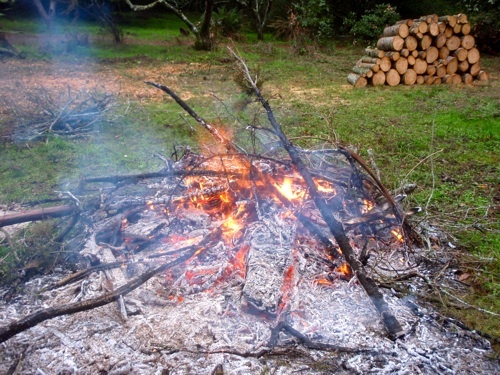 A bonfire on a chilly grey morning always reminds me of our time in West Africa. There was a common saying among village farmers, on doit nettoyer les champs, clear the fields, which pretty much always meant building a fire. Before the rainy season, entire fields would be burned to recondition the soil for next year’s crops of yam, millet, corn and sorghum. When crops were mature and needed tending, farmers would set out on foot at dawn from the mud huts of the village to collective fields ringing the compound, short-handled, hand-forged hoes hanging deftly from one shoulder. Au debut, if faut nettoyer les champs. Before working the fields, the farmers would gather loose, dry debris to build a fire, harvesting a few ripe yams in the process. The fire would be built on top of the yams and the farmers would go off to rebuild earthen mounds, redig trenches for irrigation and harvest enough produce to carry back to the village. By mid-day the fire would be down to embers and the hot sun high in the sky. Charred yams would be raked from coals, their blackened crusts expertly removed with a few strokes of a razor sharp coup-coup, and the farmers would gather for a feast of roasted yams with spicy colico before an afternoon nap in the neem grove’s shade. Our annual winter bonfires may be less prosaic, but they always give me a chance to relive our brief time in West Africa, where I was lucky enough to see the seasonal shift from harvest to rain au village. To contribute less of a carbon footprint, we typically chip or compost most of our green debris, but each year still yields a ‘burn pile’ of apple tree prunings, storm fallen branches and other less expected wood waste, and I always look forward to setting it all on fire, sans yams. I’m proud to post the final episode of Kirsten Dirksen’s three part documentary she filmed in one day this past winter when she was visiting from Barcelona, home base for her company, faircompanies.com. This is my favorite one and I think it does a wonderful job of presenting the core of my Deep Craft philosophy. I especially appreciate her featuring my Deep Deck so prominently, which I’m poised to launch this summer at Storefront Lab in San Francisco through a three week pop-up store project I’m calling Deep Craft Atelier (more about this soon). To watch the video on Kirsten’s site, read her commentary and link to her other video productions featuring “community and access to tools on sustainable culture”, please click here. 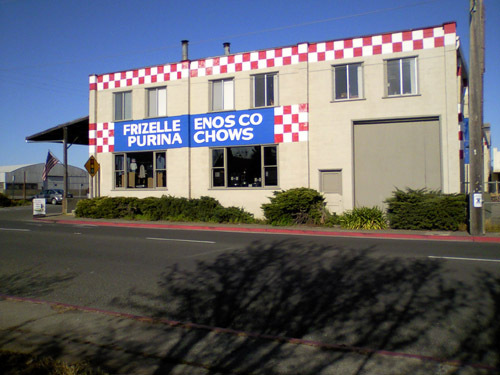 The original Frizelle Enos in downtown Sebastopol. Everybody loves Frizelle Enos, and Frizelle Enos loves us all right back. Whether you’re a rancher, apple farmer, hippy or weekender, we all need our Carhartts, straw bales, wood stoves and chicken feed, all served up with a smile at Frizelle Enos in downtown Sebastopol since 1938. Named after the two proprietors who built the store’s reputation from 1947- 66, Frizelle Enos Feeds, whose motto is “Feeds, Seeds ‘N Country Needs”, stewards the agricultural soul of West Sonoma County. 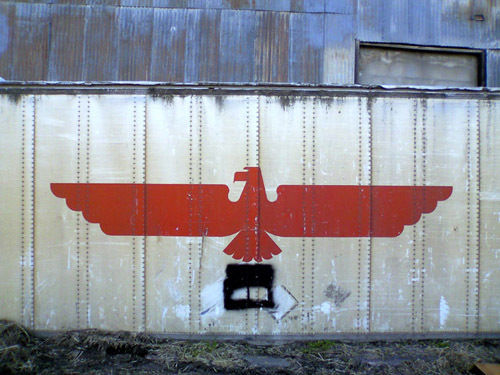 Need livestock, rooster or truck? 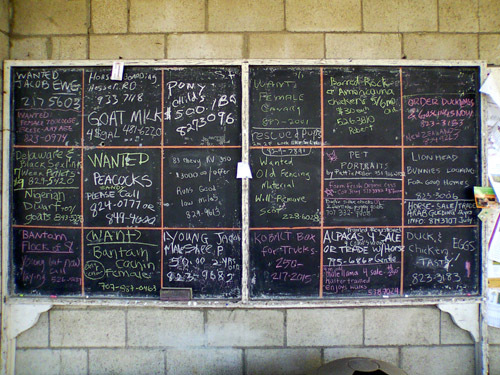 Check the community chalkboard at the store’s entry. The rear of the building captures the region’s agricultural character.